Very excited about Unearthing, a three-track sampler of which arrived yesterday. 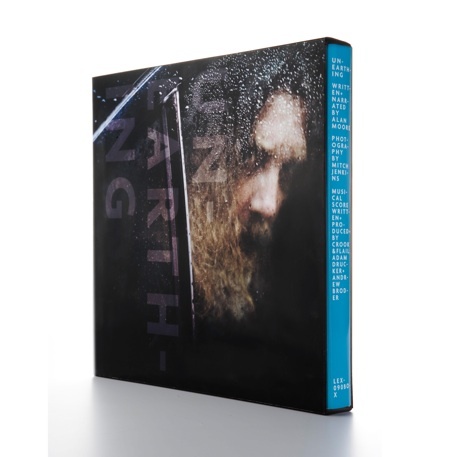 The box set brings together award-winning photographer Mitch Jenkins with the legendary comic book writer Alan Moore, who reads is own semi-autobiographical story against a score provided by Adam Drukker & Andy Broder (aka. Crook&Flail, Fog, Themsleves, Clouddead) Mike Patton of FNM, Mogwai’s Stuart Braithwaite, Zach Hill, Jesu’s Justin Broadrick and Hella’s Zach Hill. Lex founder Tom Brown’s reported to Billboard that the release had “grown out of our production values and the music we work on.” The project is due to be performed live, with shows scheduled for July 29 and July 30 under the railway arches of Waterloo station, co-produced by Parallel Arts and the Old Vic. As, an aside I interviewed Clouddead a couple of years ago for iDJ. The tracks on the three part sample are, in a word, epic. I’m fishing for a spread somewhere to show off the amalgam of art, music, literature. Check Mitch and Alan talking about the project.